Brothers Roy and Cleo Carlyle grew up in Norcross and Fairburn, Georgia, where their father, Will, ran a grocery store that had the only icebox in the area. When they weren't working in the family store, the Carlyle brothers were out playing ball. Will and Rhoda (Bennett) Carlyle had three sons who played professionally. Roy and Cleo reached the majors; Eldon played briefly with the New Orleans Pelicans of the Southern Association. Fairburn and neighboring Norcross were a small communities – Norcross was about 800 people at the time, but it produced four major-league ballplayers, all around the same time—the two Carlyles and the Wingo brothers, Ab and Ivey. Another Norcross alum, from an earlier time, was pitcher Nap Rucker. Roy was the bigger of the two boys, growing to 6-foot-3 with a playing weight of 195 pounds. Cleo was three inches shorter and 25 pounds lighter. Both hit left-handed but threw right-handed. Placed in left field by manager Lee Fohl, Carlyle hurt his shoulder slamming into the left-field fence in St. Louis and was out almost two weeks at the end of May. His bases-loaded double in the bottom of the ninth won the second game of the Bunker Hill day doubleheader, beating the White Sox, 5-3. Unfortunately, Carlyle played for a last-place team that season. Sometimes today's Red Sox fans forget how bad the team really was in the post-Ruth, pre-Yawkey era. The 1925 team won just 47 games and finished 49 ½ games out of first place. Had Roy stuck with the Senators (was that strikeout so unforgiveable? ), he might have played in the World Series that year. The rest of the Washington team did. For Boston in 1925, Carlyle hit .326 with seven home runs and 49 RBIs in 276 at-bats, second only to Ike Boone’s .330 for average. Phil Todt (11) and Boone (9) were the only Red Sox to hit more homers. In 1926, Carlyle had a good day against his old team, batting out two doubles, a triple, and a single and scoring three runs in an 8-6 Red Sox win on April 25. Overall, Carlyle hit .285 for Boston but was placed on waivers. The Yankees wanted a left-handed pinch hitter, so they refused to waive him. Ultimately, the Red Sox let him go to New York, on June 26. He served the Yankees well, finishing out the season hitting .323 for New York. On January 22, 1927, the Yankees released Roy to the Newark club (International League). He hit very well for Newark in 1927 but struggled early in 1928 and was transferred in midseason to the Birmingham team (Southern Association) where he had greater success at a lower-classification level. The Oakland Oaks of the Pacific Coast League bought Roy’s contract in December, three days before Christmas. They got a good hitter for their money. In 1929, he played in 166 games, batting .348 with 22 homers and 108 RBIs – and just edging out Cleo, who was with the Hollywood Stars, by one point. Cleo hit .347, but did drive in 136. His contract was sold yet again in December, to Kansas City. Press reports noted that he was “a hard hitter but is not considered much of a roamer in the gardens.”11 In January 1930, he married Myrtle Morris. He only played in ten games for K.C. before being sold in early May back to Atlanta. With the Crackers he hit .332 and improved his fielding to a .964 percentage. It was a full 1931 season with Atlanta (.357, with 19 home runs), but fielding was a problem again (.939). After hitting .322 for Atlanta in the first month of the 1932 season, he was put on waivers and played the remainder of the campaign with both Scranton (of the New York-Pennsylvania League) and Indianapolis (of the American Association). 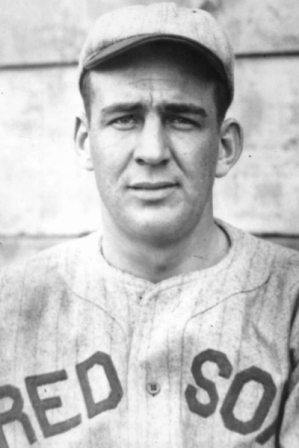 Myrtle Carlyle said Roy’s career ended in 1932. Despite her recollections, he played in five games for Charlotte in 1934. After leaving baseball, he was an owner of a hardware store in Norcross. In addition to the sources noted in this biography, the author also accessed Carlyle’s player file and player questionnaire from the National Baseball Hall of Fame, Bill Lee’s The Baseball Necrology, the Encyclopedia of Minor League Baseball, Retrosheet.org, and Baseball-Reference.com. Thanks to Rod Nelson, and also to Will Hammock of the Gwinnett Daily Post for some of the information contained in this biography. 1 Tampa Tribune, March 7, 1925. 3 New Orleans Item, July 11, 1922, and the Tampa Tribune, March 7, 1925. 4 Boston Globe, July 6, 1925. 5 The June 25 Washington Post noted his reaching the century mark, with his 100th hit the day before. 6 The story of the deal with Washington was reported widely. See, for instance the Charlotte Observer of June 15, 1924. Joe Engle as scout was mentioned in the 1925 Tampa article, though his name was misspelled. 7 Boston Herald, April 30, 1925. 8 Boston Herald, June 16, 1926. 9 Boston Herald, March 14, 1927. 10 See for instance the Augusta Chronicle of July 24. 11 San Diego Evening Tribune, December 7, 1929. He had a .946 fielding percentage with Oakland, so he was improving on defense. 12 The Sporting News, December 5, 1956.